If you follow me over on Instagram @nailbeautylife then you may have figured out by now that I'm slightly obsessed with coffee.....maybe coffee is the reason I don't sleep too well of a night time?! So on a recent trip to Primarks over in Cwmbran, whilst having a browse through there home section of the store I came across a section of shelves that were full of all different travel mugs and just knew there and then that I needed to buy myself 1 or maybe even 2 haha. 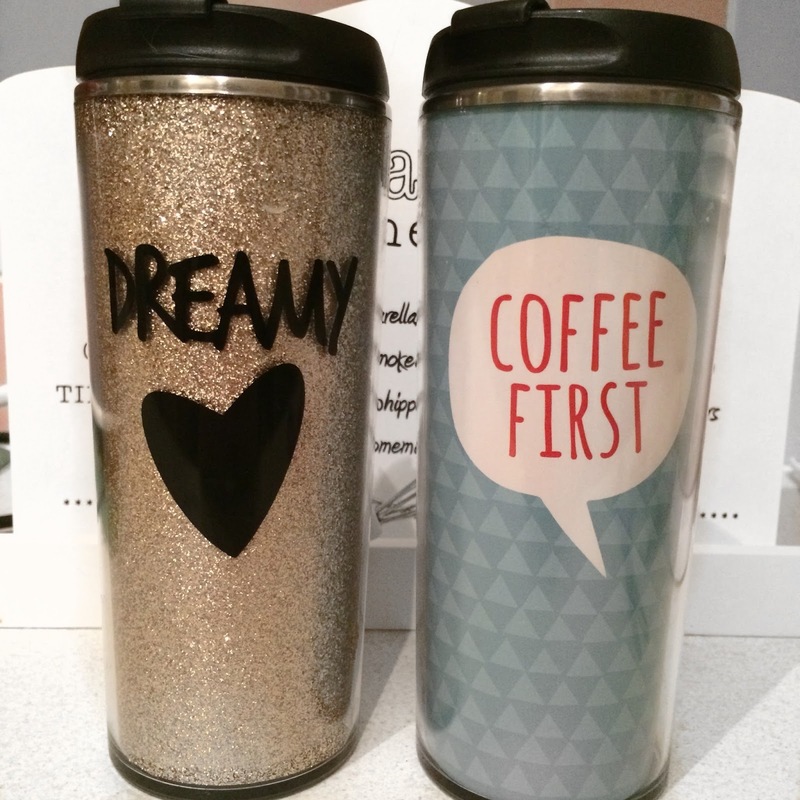 These travel mugs are priced at just £3.50 each, which isn't too bad of a price considering how good of quality that they are and with all the travelling that I do to London every couple of weeks, these travel mugs are bound to come in handy and be well worth the money. 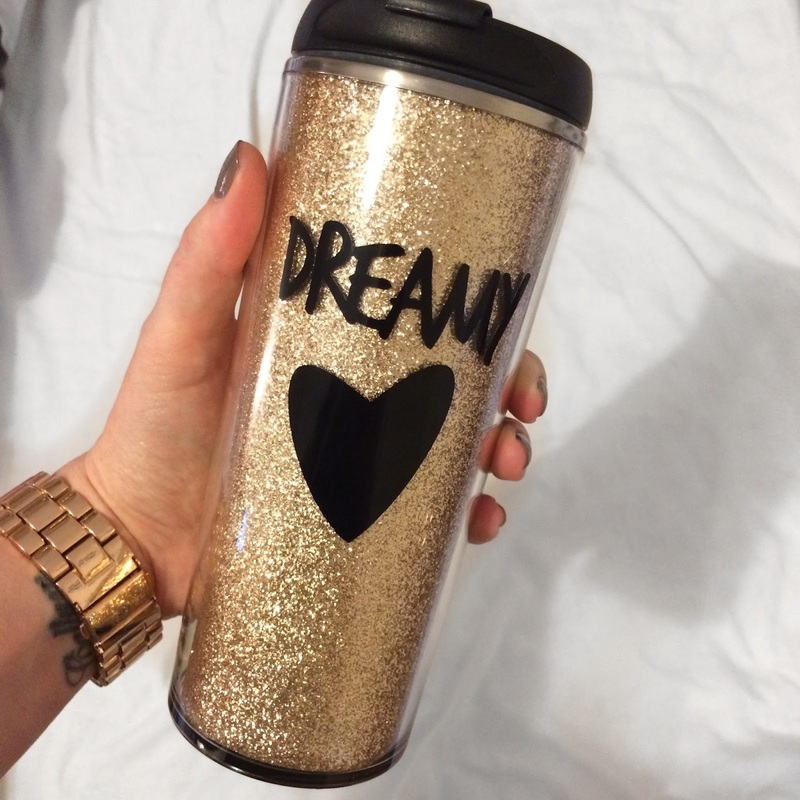 The first one that I picked up was this gorgeous glittery gold one with the saying "DREAMY" on it with a black heart underneath the writing. I just thought this looked really lovely and was perfect for this time of year, the inside of it is metal which means the coffee (or whatever your choice of hot beverage is) will stay warm for ages. At first I thought the black writing and heart would start to come off after a few washes, but it hasn't come off at all which I was really happy about as there's nothing more disappointing than buying something just for it to all peel off after a few days. 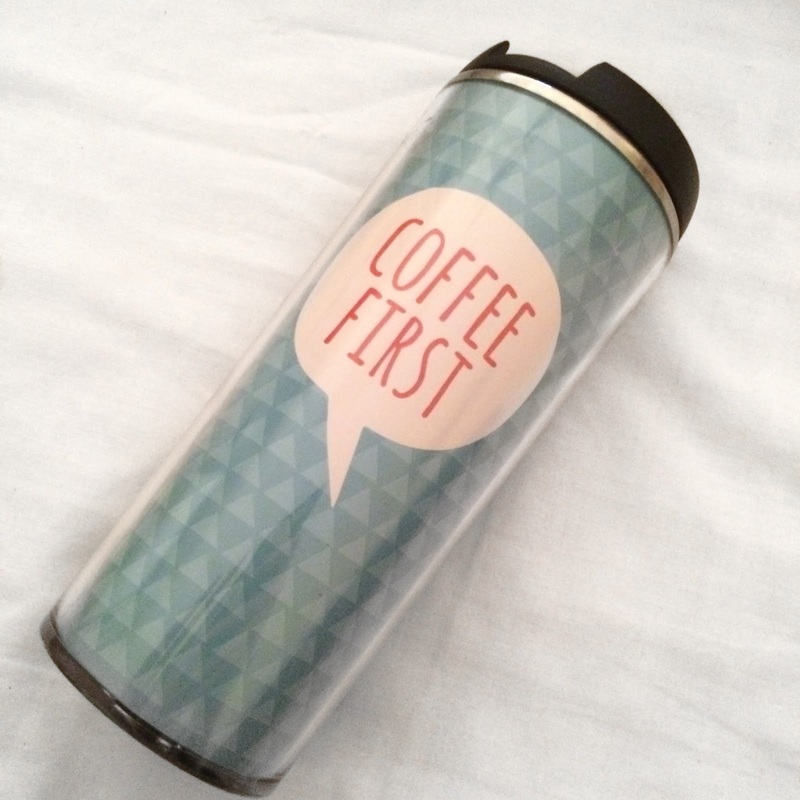 On another visit to Primarks, I decided to pick up another travel mug whilst I was in there, but this time in a bluey/green triangle patterned colour with a little white speech bubble on the front of it which has the quote "COFFEE FIRST" inside of it and a silver rim around the top of it. This also has a metal lining inside of it to make sure your drink stays warm for ages. I've tested both these travel mugs out to see just how long the coffee stayed warm for and it was well over 1 hour before it started to go cold, which I personally think is really good. There are quite a few other gorgeous travel mugs available in Primarks, but for now I think 2 is enough for me...until I see another one that I like haha.